Regavim organization reveals: Bedouin criminals set up greenhouses yielding millions in drug money per year in military training zones. IDF training zones in southern Israel have become a safe haven for Bedouin drug cultivation. Surprising pictures published this evening, Wednesday, document the method of growing thousands of marijuana plants in the middle of military training zones, and the way the plants are smuggled out to be sold. A training camp in southern Israel has been plagued in recent years from headlines mostly involving thefts from soldiers training at the base perpetrated by Bedouin criminals with ATVs who enter the premises unhindered during shooting exercises and steal ammunition and military equipment. 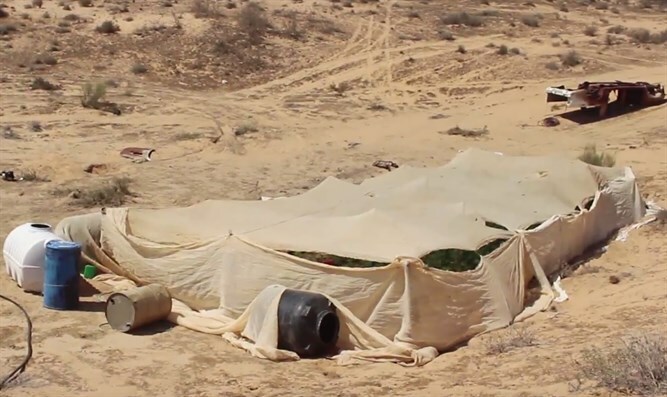 Now, it seems that, amidst the tank fire, the shooting ranges, and navigation areas, thousands of marijuana plants are being hidden, where they were planted by Bedouin criminals in a large number of greenhouses. The criminals take advantage of the fact that the area is closed off to civilians, and establish temporary greenhouses in hidden corners of training areas. Every greenhouse contains hundreds of marijuana plants, covered with cloth canopies in desert colors to make them hard to identify, and the sites include water canisters and fertilizer. According to assessments, the value of marijuana included in each greenhouse is more than a million shekels, and the net profit from a yearly cycle of all the greenhouses in the area amounts to tens of millions of shekels. A hidden security camera that was installed near one of the greenhouses shows the criminals arriving in ATVs and Jeeps to the area and packing drugs onto the vehicles for hours on end. In an additional video filmed in recent days, Regavim representatives arrived at some of the greenhouses and documented what is happening there; they intend to pass the footage to police. “For years, we documented and warned of Bedouin criminals stealing ammunition and military equipment unhindered, but now it appears that that is only the tip of the iceberg,” said Amichai Yogev, head of Regavim’s southern division, which has been working for years against illegal building in the Bedouin sprawl and to gain control over state land.